This morning we went out for breakfast. We’ve gone thru a lot of changes in the last few weeks. We finished up a fun but stressful summer at the Colorado renaissance festival. We bought an RV. We found someone to buy our house. We found some land we want to buy. We traveled around seeing family and friends. We’re “camping”in our RV at the lake this week. (But if it is your home, it is not camping as the Rennies will tell you. It is just living. So I guess we’re just living at the lake.) But soon we will be living on our new land, and Travis and Debbi will each be close by. If not also on our new land. 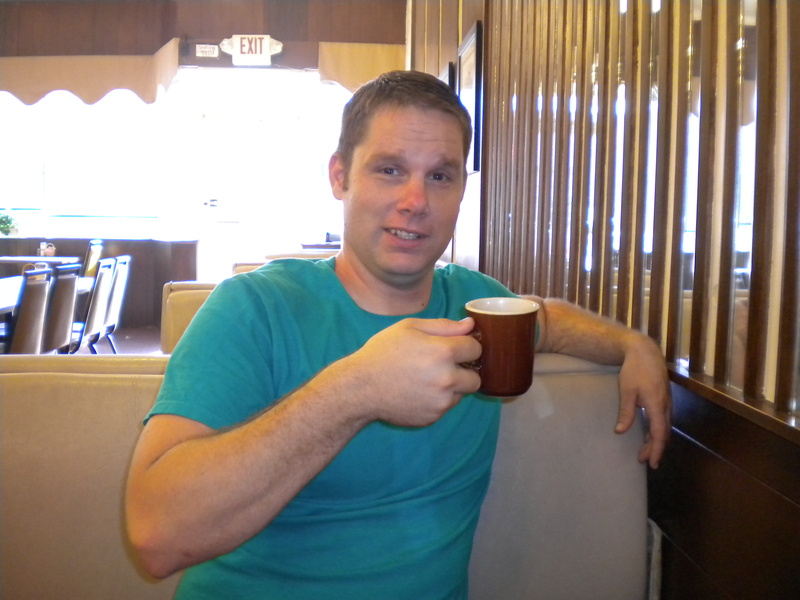 The best thing to do when you wake up and you’re already pooped is have a cup of coffee. In fact, this is the best thing to do first on any morning. But it’s better if you can go somewhere and have someone else make the coffee for you. So, we went to the Sterling Cafe. This is the best cafe either of us has ever been to, and we go to cafes a lot because we like them. (Also I used to wait tables there. But that’s beside the point.) 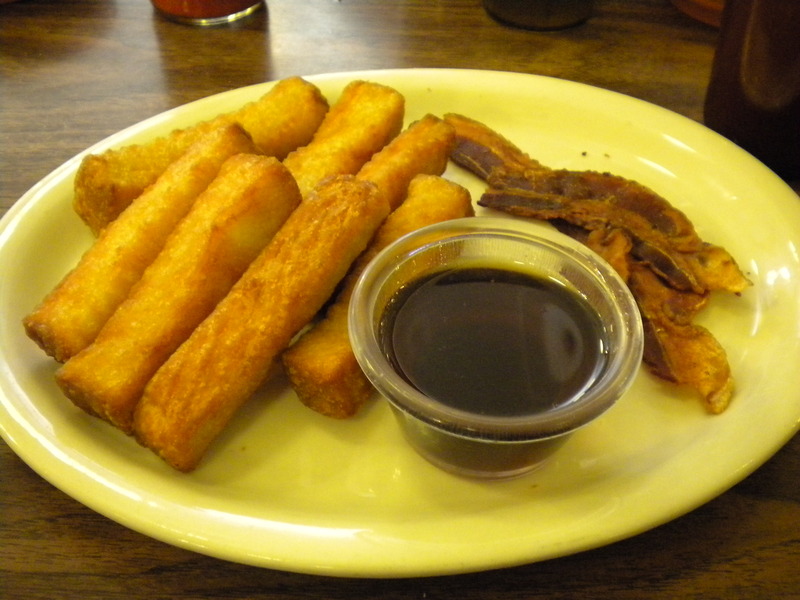 The Sterling Cafe is the standard by which all other hometown cafes, diners, and eateries are judged. Deena, the owner, has been waiting tables here for more years than I can tell, and the place just gets better every time. And the coffee can’t be beat. This is Adam, being suave while I check out the backlight feature on my new camera. After I schmoozed with the regulars who still care about what’s going on (or maybe they just want the freshest gossip, who knows!) Deena already had the coffee and cream on the table, and we ordered without even glancing at a menu. 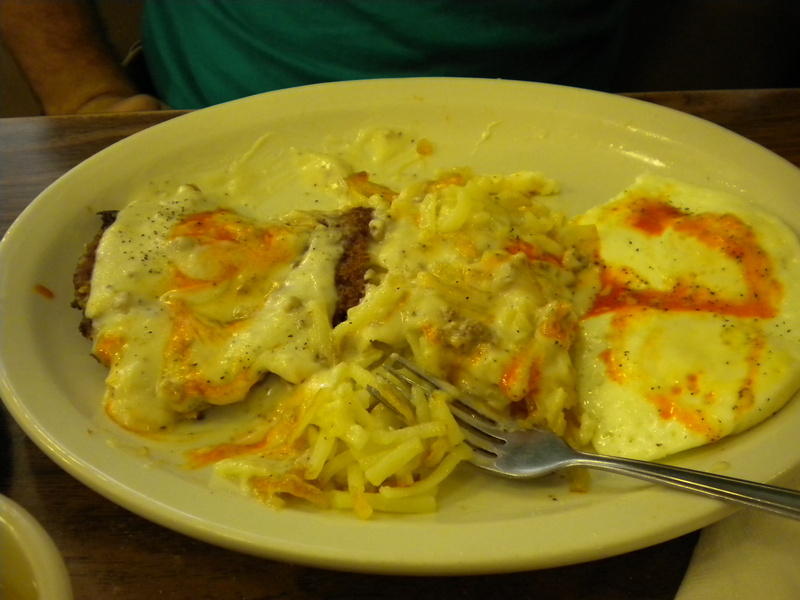 Adam had his usual- Country fried steak and eggs with hashbrowns and lots of gravy, whole wheat toast. I can’t help thinking of this as: CFS 2om HB gravy WW. Mmmm… Hot sauce on everything. My camera also has a “food” setting. This is properly cooked bacon. If your bacon is floppy, you are missing the whole point of bacon. We drank 4 cups of coffee each, chatted with Deena, and were on our way across the street to the bank to get more things done.You can get a lot done on 4 cups of coffee. Soon we’ll be packed off to Missouri and I’ll have to make the coffee myself every day, probably over a fire (okay, that’s an exaggeration).